Hewlett-Packard believes the future of laptops lies in "converged" devices like its new Pro X2 410, which is a tablet that comes bundled with a detachable keyboard. The hybrid device, announced on Monday, has an 11.6-inch screen that can be used as a tablet and gives more than 12 hours battery life with a keyboard attachment. The product run Windows 8.1 and buyers can choose among Intel's low-power Core Y-series processors based on the Haswell architecture. It will be priced under US$900 and there will be no option to buy just the tablet, which was designed with the keyboard attachment in mind, said Aaron Slessinger, notebook category manager at HP. HP will sell the product as a "converged device," Slessinger said, adding that HP considers it a PC first and a tablet second. "It essentially gives you the same performance in slate mode as it does in keyboard mode," he said. 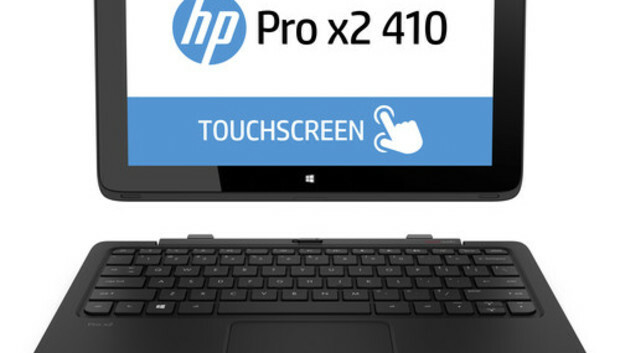 HP will show the Pro X2 410 at the International CES trade show this week in Las Vegas. The company also offers the Split x2 detachable, which is targeted at consumers. The Pro X2 410 weighs over 907 grams but its display, at 11.6 inches on the diagonal, is larger than those of most regular tablets, which generally have 7- to 10-inch displays. HP's tablet has 2-megapixel front camera and a back camera, and the screen shows images at a 1366 x 768-pixel resolution. The keyboard attachment has a battery pack and USB and HDMI ports. HP also announced budget laptops with Intel's Core, Pentium and Celeron processors based on the Haswell architecture. The HP 350 G1 family will include 14-inch and 15.6-inch models, and users can select graphics processors from Advanced Micro Devices. The HP 210 is a netbook-style laptop with an 11.6-inch screen, with an option to buy a touchscreen model. Prices and shipping dates for the laptops were not available.